Conor McGregor alone has proven that anything can happen in the world of combat sports. With all the critics around the Floyd Mayweather fight, there have been some interesting changes of pace since the fight went down. For one, noted MayMac abolitionist, Oscar De La Hoya, has issued a challenge to Conor McGregor for a boxing match of his own despite the apparent irony in such a challenge. Now, however, there have been talks of a more interesting match-up. Manny Pacquiao issued a tweet in November warning Conor to stay fit with the hash tags “#realboxingmatch, #2018” emblazoned across the bottom. Despite the ups and downs of the media propagating this fight since then, momentum has seemed to carry it through to initial talks between the camps. 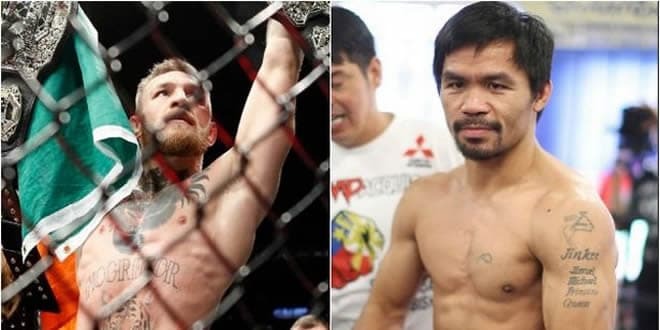 Pacquiao confirmed with an international news source, AFP, that he initially reached out to the McGregor team about a possible match in April of 2018 but no follow up conversations have yet to take place. He was quoted, “if we can negotiate it, I have no problem. It is OK with both of us.” Insinuating that both teams have their ears open to the match-up but nothing yet has been confirmed. The question still persists, is this a good idea for McGregor? Freddie Roach, Bob Arum, and even Dana White think it’s not. The Irishman was stopped in the 10th round of his first professional boxing match with Floyd Mayweather who reportedly was carrying the McGregor into the later rounds on purpose to make it more of a spectacle. Most boxing minds are inclined to agree with that assessment as Floyd hasn’t won a legitimate knockout victory in roughly 10 years against more competitive boxers. Another question is posed in my mind as well, why Pacquiao? The Filipino senator and now Colonel in the Filipino Army lost his WBO title in a boxing match that basically nobody watched. He was on the wrong end of an Australian decision against Jeff Horn where he looked to be well past his prime. Does Manny think that despite his age and other ambitions that he could gain some boxing spotlight by beating McGregor? Freddie Roach, Pacquiao’s trainer, was interviewed by FightHype where he said that “it’s a very winnable fight and there’s a lot of money to be made from it.” Roach then continued to remark on how he didn’t view it as a fair fight and that the two fighters would essentially be “ripping off the world” as it wouldn’t a boxing match but rather, a sporting spectacle. He even mentioned that it would be fairer in the MMA ruleset despite Manny’s reported distaste for MMA as it appears like more a street fight than a professional sport. Whatever happens, it appears that by losing a fight to the best boxer in the world, Conor McGregor managed to become the highest draw in both MMA and Boxing. ……What a world we are living in!